Random House Books for Young Readers, 9781524715663, 304pp. 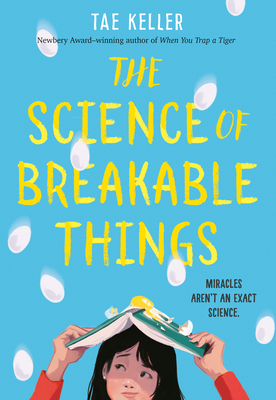 Natalie's uplifting story of using the scientific process to "save" her mother from depression is what Booklist calls "a winning story full of heart and action." When Natalie's science teacher suggests that she enter an egg drop competition, Natalie thinks that this might be the perfect solution to all of her problems. There's prize money, and if she and her friends wins, then she can fly her botanist mother to see the miraculous Cobalt Blue Orchids--flowers that survive against impossible odds. Natalie's mother has been suffering from depression, and Natalie is sure that the flowers' magic will inspire her mom to love life again. Which means it's time for Natalie's friends to step up and show her that talking about a problem is like taking a plant out of a dark cupboard and giving it light. With their help, Natalie begins an uplifting journey to discover the science of hope, love, and miracles. A vibrant, loving debut about the coming-of-age moment when kids realize that parents are people, too. Think THE FOURTEENTH GOLDFISH meets THE THING ABOUT JELLYFISH. "Natalie's Korean heritage is sensitively explored, as is the central issue of depression." "A compassionate glimpse of mental illness accessible to a broad audience." "Holy moly!!! This book made me feel." TAE KELLER grew up in Honolulu, Hawaii, where she wrote stories, ate spam musubis, and participated in her school's egg drop competition. (She did not win.) After graduating from Bryn Mawr College, she moved to New York City to work in publishing, and now has a very stubborn Yorkie and a multitude of books as roommates. Visit her at TaeKeller.com, follow her on Twitter at @TaeKeller, and be sure to join her newsletter bit.ly/taekellernews.